New Year's is almost upon us and now's the time to print off some wonderful free New Year's cards to send to everyone you know. 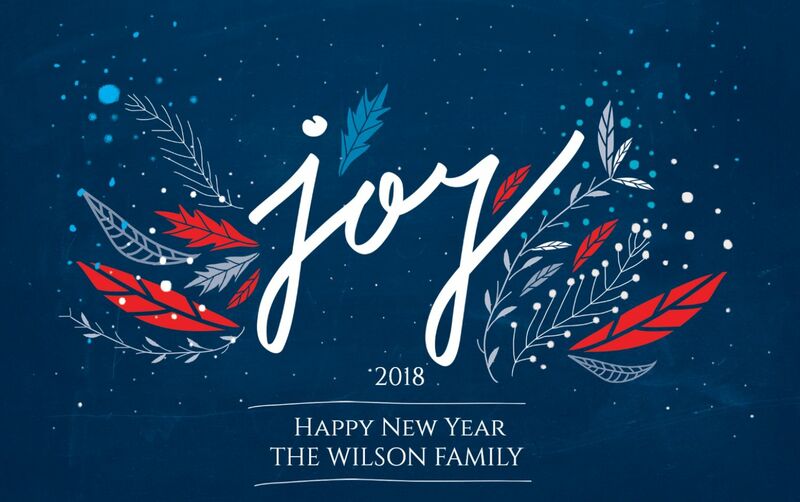 These New Year's cards will wish your loved ones a Happy New Year and allow you to add your custom wish for the new year. The cards look great and no one will even know that you got them for free. 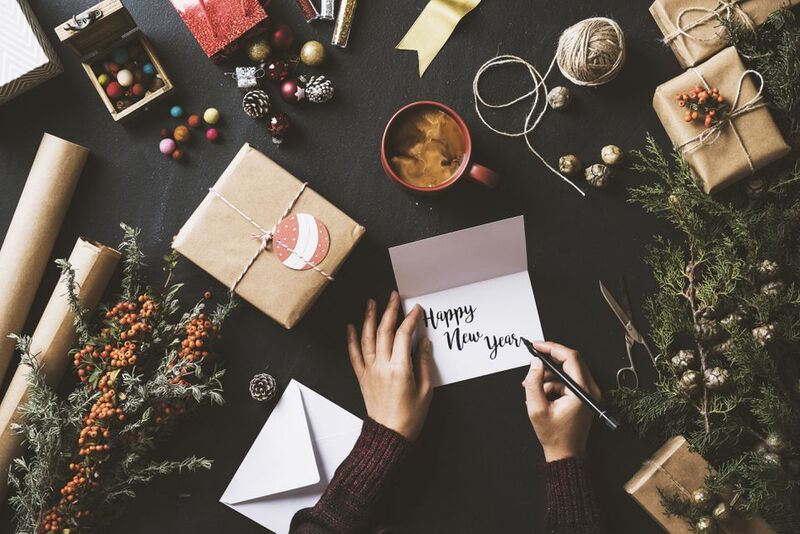 When you're finished customizing your New Year's card, slip into one of these free, printable custom envelope templates and it's ready to go. If you're short on time, you can send a free online New Year card to instantly wish your friends and family a Happy New Year. we also have a list of New Years Eve party games for adults if you plan on celebrating the new year with a party. If you forgot to send out your Christmas cards this year, this Joy of New Year card from Greetings Island is a great substitute. The card is stylishly decorated in blue, red, and white with room on the front for the current year and your name. The inside text says "Hoping You Get to Bring in the New Year with Friends, Family, and a Fabulous Celebration!" This card prints out as 7" x 5" and has 7 available choices for the inside layout. "Keep All Of Your New Year's Resolutions, Darling" is printed on the front of this pink and blue New Years card in a modern and fun design making it great to send to anyone and everyone you know. The inside says "It's a brand New Year to be Yourself" with plenty of room left to put your name. This adorable card features two birds holding up a sign to welcome in the new year. This sign can easily be customized with any year. Inside the cards says "Here it comes! A year that's new! Hope it brings all the best to you! Happy New Year!". You can customize this New Year's card with your own photos, stickers, and text before printing. Greetings Island has designed this beautiful New Years card with swirly text that wishes the recipient to have an awesome year. There's also a place for your name. Not only can you choose the background color for this card (gold, blue, or black) you can also fully customize the text and add stickers and photos. There's a choice of 7 inside layouts so you can get it just how you want it. This is a 5X7 printable card that you can print right away or download as a PDF for printing later or send in digital form. This pretty floral New Year's card from Got Free Cards can be customized with stickers, text, and photos before printing. The cover says "Wish You a Happy New Year" and the inside is left blank so you can write your own greeting. This New Year card will wish your loved ones a Happy New Year while thanking them with a message from a cute bird. The New Year is a wonderful time to thank everyone you know for the wonderful things they do.